https://sep.yimg.com/ay/yhst-33477391359232/california-spotted-stingray-urolophus-halleri-round-sting-ray-9.jpgCalifornia Spotted Stingray - Urolophus halleri - Round Sting Ray Expert Only!!! The California Spotted Stingray is also known as the Spotted Stingray or Spotted Caribbean Stingray. It is a bottom-dwelling fish, with a dark brown body with tan spots and rings. The tail spine is venomous, but is only used for protection. Caution should be taken when netting it, or when it is not visible and maintenance is performed in the aquarium. The California Spotted Stingray is grayish brown either plain, mottled, or spotted with dark blotches, on the dorsal surface, fading to a pale yellow, orange, or white underside. The California Spotted Stingray has a nearly circular disc-shaped body with a tail that is shorter than the length of the disc. The snout of this ray terminates in a rounded point. The prominent pectoral fins of the California Spotted Stingray are rounded. The dorsal fins are absent, however the rounded caudal fin is present in contrast to many other rays that lack this feature. A long venomous spine is located approximately halfway down the length of the tail. 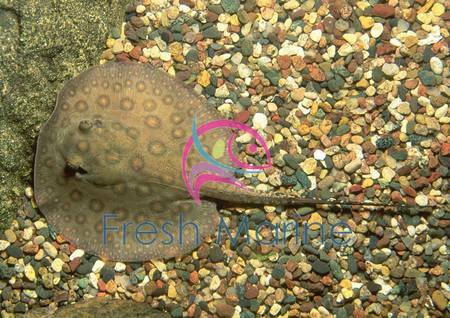 The California Spotted Stingray mate during the winter months of January upto March. During the mating season, solitary males search for females using visual and electrosensory cues. An interesting scientific finding is that reproductively mature females emit localized positive electric fields from near the spiracles behind each eye. This attracts males and mating behavior ensues. Males often bite the posterior of the females' discs. The females often escape, resulting in failure of copulation. However, when a male bites the anterior portion of the female's disc, the female does not attempt to free herself. This biting behavior functions to maintain contact between the pair during copulation. General Size: The California Spotted Stingray usually come in 6 to 12 inches. Minimum Tank Size: The California Spotted Stingray prefers a tank of at least 200 gallons with plenty of places to hide & swim. Tank Conditions: The California Spotted Stingray should ideally be kept in temperatures between 72 and 78 degrees Fahrenheit. A pH value of 8.1 or 8.4, and a specific gravity of 1.020 to 1.025 should be maintained. When kept with invertebrates, the specific gravity range should be 1.020 to 1.025, for the invertebrate species. In a fish only aquarium, the specific gravity should fall between 1.020 and 1.023. Habitat: The California Spotted Stingray lives in sandy and muddy bottoms in relatively shallow waters of beaches as well as in bays, channels, and inlets. Diet and Feeding: The California Spotted Stingray is a carnivore and likes to eat variety of chopped crustaceans, fish pieces, shrimp, shellfish, squid. Feeding may be difficult in the beginning. The best way to begin feeding is by offering small pieces of cleaned squid or freshwater ghost shrimp. Breeding: Development of the California Spotted Stingray is ovoviviparous, resulting in live birth. After a gestation period of approximately 3 months, a litter of 3-6 young are born in shallow waters. Each newborn measures 2.5-3.1 inches (6.3-8.0 cm) disc width. The young rays will remain in shallow habitats, which provide rich feeding grounds as well as protection from predators, until they are large enough to move out into deeper water. One known nursery area for the round stingray is Newport Dunes in southern California.